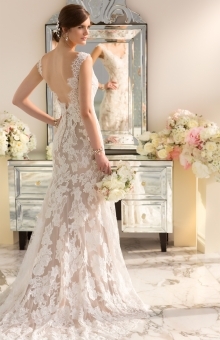 For brides looking for modern day vintage form fitting wedding dresses, Essense of Australia has created this designer Lace over Lustre Satin wedding gown with a scalloped Lace neckline and low back. Customize your gown to best reflect your sophistication and unique style with or without Diamante beading and Lustre Satin underdress colors in white, café, harvest or ivory. 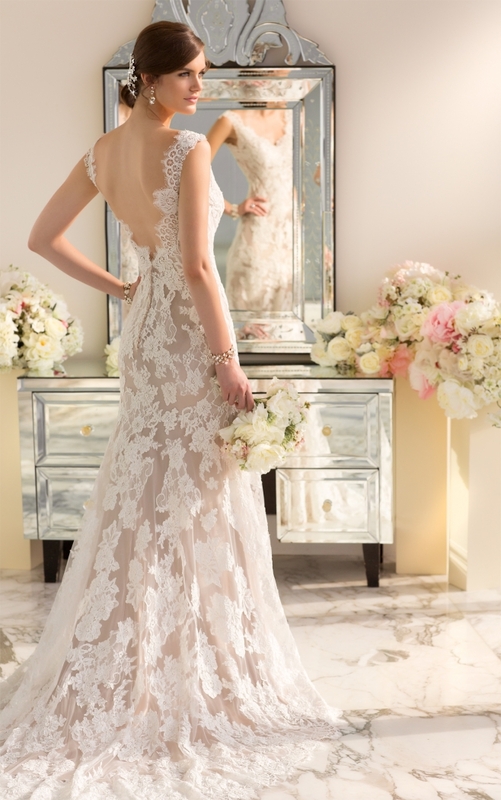 The Lace overdress can also be customized in your choice of traditional white or rich ivory. The back zips up under fabric covered buttons. This Lace and Lustre Satin comes with a detachable 1.5” Grosgrain ribbon sash in your choice of orchid, blossom, black, natural bisque, malt, white and topaz.